On Oct. 26, the Georgia Association of Physicians of Indian Heritage (GAPI) presented a production characterized by mesmerizing choreography and incredible costumes, all in the name of charity. “Once Upon a Time — Beauty and the Beast” was performed to a sold out crowd at the Gwinnett Performing Arts Center to raise money for both Georgia’s veterans and victims of sexual abuse and human trafficking. 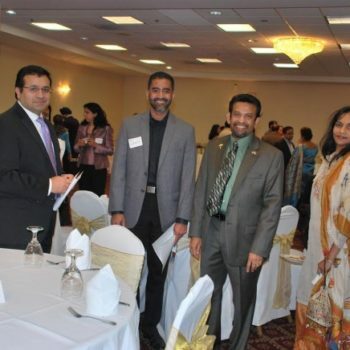 President of GAPI Dr. Indran Indrakrishnan informed the full house of GAPI’s expanding humanitarian services, including partnering with different organizations that help the community. This particular fundraiser benefited both Tapestri, a culturally sensitive organization that provides aid to victims of sexual abuse and human trafficking, and Soldier’s Angels, an organization that provides support for veterans and currently deployed soldiers. The eagerly anticipated production was sold out weeks in advance. The Indian Dance Drama was performed by the Third Eye Dancers in conjunction with the students of the Bharathakala Naatya Academy. Both the concept and the choreography for this performance was created by the Bharathakala Naatya Academy’s own Smt. Subathra Sudarshan, a highly respected and decorated woman in the world of Bharatanatyam, one of India’s oldest and most sacred dance forms. The production featured many familiar fairy tale characters including Belle and her prince, Snow White and the Huntsman as well as recognizable villains like the Wicked Witch of the West and Ursula. This production offered both the Third Eye Dancers and the academy’s students an opportunity to spread awareness through dance. As a not for profit organization, the Third Eye Dancers perform to draw attention to issues that affect the community. They rely on this unique approach to encourage patrons of their productions to help find solutions to the problems.